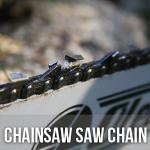 Please note: as chainsaws are high-precision and potentially dangerous machines, we recommend only using chainsaws with the full range of safety equipment and clothing. We also recommend, before using a chainsaw the operator is familiar with the safety features on the saw and is familiar with the correct and safe operation techniques. 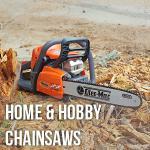 Some chainsaws will require a final assembly, testing and checking prior to being dispatched or operated. We have available Forestry Industry safety DVD’s for safe chainsaw use and proper felling techniques.